A wonderful sherry bomb with a complex variety of flavors. In my opinion, this malt can not be described better. Chocolate, nuts, dark berries, caramel, sweetness, spice, espresso, the complete band ready is available and makes my sherry heart beat faster. A great malt, I like it very much! Long and tough drops pull their syrupy paths back into the glass on the glass wall, dark and rust-colored amber shimmering mysteriously in the glass. Dark grapes and berries stand majestically out of the glass, old oranges and peaches are zealous. A mixture of creamy milk chocolate and bitter dark chocolate spreads opulently in the nose, a touch of coffee and a slightly sour fruit notes rise from the dominant chocolate note. Dried raisins and sour cherries come into their own, spicy wood tones and a subtle balsamic note exude their spicy and slightly sour bouquet. The different flavors such as balsamic, cherries, chocolate and oranges try to play their dominance, resulting in an extremely spicy and multi-layered aroma. Creamy and complex, the first sip flows over the tongue into the mouth. Milk chocolate and creamy caramel mix with old oranges and velvety peaches. A subtle espresso aroma is slowly becoming intense and ends in subtle bitter and tart aromas. Hazelnuts and walnuts merge with the creamy chocolate to a sweet mass with tart and spicy notes. Slowly the alcohol makes itself felt with a pleasant glow on the tongue. Creamy and harmonious, the variety of aromas exudes a chubby warmth in the mouth. Dark berries and creamy chocolate rest on the tongue, walnuts and a touch of espresso are added to create a wonderfully harmonious and dark fruit mouthfeel. Again mix creamy milk chocolate and walnut chips, tart and spicy rest the creamy aromas long in the mouth before the wonderfully creamy finish slowly fades away. Walnuts and chocolate as well as slightly dry and tart wood tones are remembered for a long time. 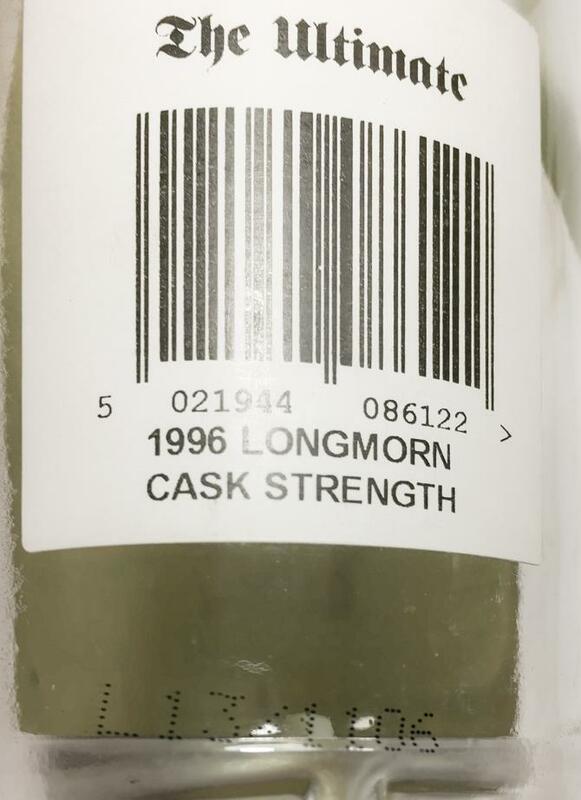 Compared this one with https://www.whiskybase.com/whisky/43083/longmorn-1996-vw. This one seems to be a sweeter version. It is, but that's because the other is actually quite dry. Overall, this one is more complex, friendlier and fruitier. 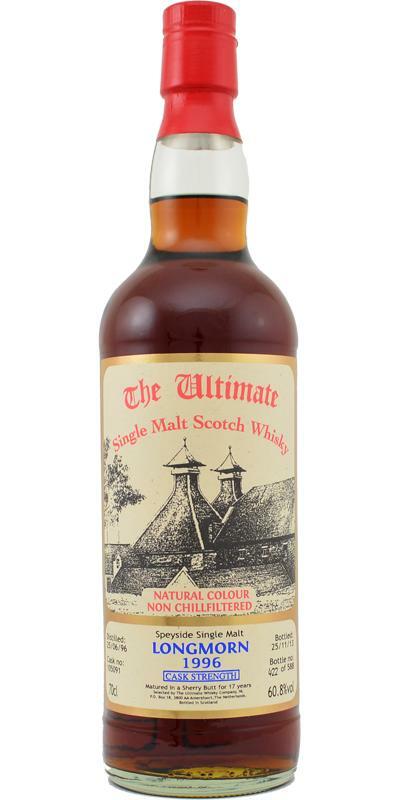 The colour makes you think this is an ultimate sherry bomb. At first nosing, it's not just overpowering sherry (luckily). Of course, some nutty and sweet (raisin) notes of a medium sweet sherry are there. Yet there is more: wood, spice (also from the wood), orange and apricot. After a while, treacle (Appelstroop from the Netherlands) shows. Behind this all, there is a gentle salty, beefy undertone, with old leather. It has a punchy, salty and beefy attack, with quite some pepper too. It's followed by orange, some dried fruit (mainly date), bitter chocolate and coffee. It's certainly earthier than on the nose, with tobacco. The finish is long, savoury, slightly sour (which is good), and medium bitter. There is pepper, date, raisin, dark chocolate and still some tobacco. Nicely balanced. Coffee, orange, chocolate, mocca, cacao, fruity, balsmico and port. Syrup, woody, strawberry marmelade, cherries. With water more cherries. Cherries, chocolate, nuts, syrup and fudge. A touch of sulphur, coffee, spices and earthy mushrooms. Very long with forest fruits, spices, orange and cloves. M: wonderfully creamy mouthfeel but already strong in alcohol, you already notice the high percentage of alcohol. The sweet, less the fruit, is definitely in the mouth, certainly a PX barrel. But then dries off something dry, with walnut and dark chocolate. A lot of wood. A: sherry, balsamic, cigar, leather. Herbaceous notes occupy the tongue for a long time. Maintains good overall balance, is tasty but never boring. On the nose, vinous note, candies, caramelized almonds, chocolate, what a richness! On the palate, delicious sherry, perfectly integrated alcohol. Final evoking a dark chocolate dessert (very black!) Coming out of the oven! With a little water, on the nose, the chocolate is a little caramel. I also have roasted hazelnuts. The mouth loses a bit of power and greed, but it starts from so high! A jewel to savor pure, slowly. An excellent, dense and concentrated sherry monster, lively, vigorous, the aroma initially closed and fastened pretty soon reveals itself, an excellent balance, power and potency. Good work with the fortress, also pleases that with an abundance of sweet constituent molts does not roll into luscious syrup. Must have. Closed, raw, cold, slightly spirituous, the first nose is mineral tones, sulphurous notes, then dried fruits and raisins begin to make their way, raisin a lot, it practically feels tangible - moist and sweet, dried apricots, warm, southern sun, fragrant, dried apricot / , prunes of prunes, beef stew with prunes, ham, processed wood of noble breeds. Charcoal on a background of dried fruits and citrus candied fruits - orange, pomelo and grapefruit crusts in sugar, ginger, cream, toffee, cake "Anthill".